Sanitation in India’s cities relies heavily on the most oppressed castes – the erstwhile untouchables, the Dalits. Not only is the work itself degrading, it is also performed under extremely hazardous conditions. But it is only when tragic incidents occur in the metros – as they did last year in Delhi and the beginning of this year in Mumbai and Bangalore, where manual scavengers died while fixing and cleaning sewers and cleaning septic tanks in hotels – that their social background, the indignities they face and the risks they take to keep cities clean come to public notice. Results of a study conducted by the authors in the industrial town of Angul in Odisha shed light on how urban sanitation work perpetuates caste stereotypes, which are further reinforced by city residents. Angul is an industrial city surrounded by a number of public and private sector mining companies. It became a Notified Area Council (NAC) in 1955, and was extended in 1977 to include two villages – Hulurisingha and Baniabahal – and a part of the Turanga forest. Angul became a municipality in 2008. It is spread over 19.24 square km and has 23 municipal wards. According to the 2011 Census, Angul has an urban population of 43,794, of whom 5,039 belong to Scheduled Castes and 1,473 to Scheduled Tribes. The Angul municipality has 27 slums, out of which 13 are unauthorised and 14 are authorised. The slum population is 10,950. Sanitation in Angul city comes under the purview of the municipality. Currently, on-site sanitation with septic tanks and pit latrines is the practice in the city. The city largely has open drains, with only limited closed drains. Household waste, waste in the market place, garbage dumped by people, household toilet waste (from toilets connected to drains) and sludge collected by manual scavengers are all dumped into the drains. Manual sanitation in urban centres rests on the caste system. The lowest castes, whose traditional occupation has been sweeping, scavenging and dealing with dead animals, work as sweepers and scavengers in urban centres as well, keeping them clean. Their work as manual scavengers continues despite legal prohibitions. All municipal sweepers in Angul municipality are from the the Hadi and Ghasi SC communities, who live in slums and separate hamlets away from other castes. The Angul municipality employs sweepers both directly and through contractors. People from nearby villages are also recruited as sweepers, but no one other than lower castes is willing to work as a sweeper. The sweepers say that their work though considered dirty and degrading, and is readily available to them because there is no competition. A majority of them work as contractual labourers for low salaries. 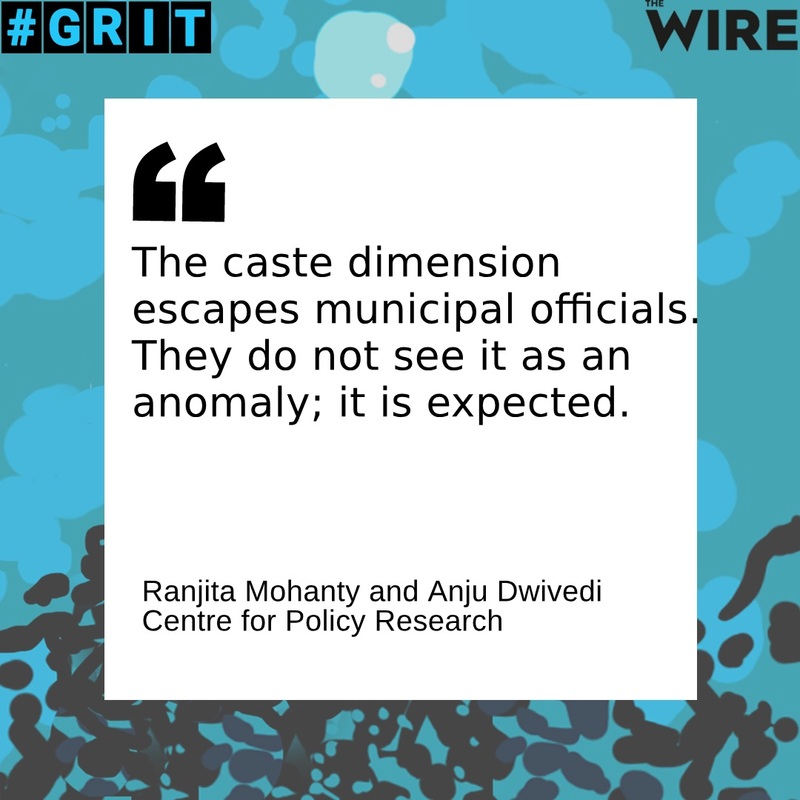 The caste dimension escapes municipal officials. They do not see this as an anomaly; it is expected: ‘Those who know the best are in the job’ is the rational a municipal official gave, thus attaching a professional skill dimension to what is otherwise a consolidation of caste status quo. The cleanliness of the city depends on a host of services – sweeping the streets, garbage collection, rag picking, cleaning the open drains, removal and disposal of dead animals, cleaning sewers and sometimes desludging toilet tanks where on-site sanitation is practiced and mechanisation is either not available or expensive, or manual cleaning is preferred by the residents for the reasons such as long gap of desludging turns faecal matter into solids that it becomes difficult for machines to clean, or because of the cost involved in diluting the solid waste that clients have to pay when they opt for mechanised cleaning. The sweepers collect door-to-door garbage as well as garbage from the market and public buildings, they sweep the streets and clean the drains, cut bushes, spray mosquito oil, chlorinate the open wells and collect unknown dead bodies, both human and animal. While the sweepers are mostly provided with gloves and boots – gloves to handle the garbage and cleaning of the drain, and boots to prevent contamination when they step into the drain to clean – they don’t use them as they find them unwieldy. The officials are of the view that sweepers find these accessories/aids an obstruction to free movement. However, given the risk involved, the officials should be enforce the service rules that make it mandatory for sweepers to take precautions. But official will for that is missing. Manual scavenging, though legally prohibited, is widely prevalent in Angul city. The state government is currently undertaking a survey to identify them. The sweepers work also as manual scavengers and clean private toilet tanks. The practice is not a secret, and is allowed to continue in the absence of mechanised methods of sludge disposal as well as residents’ preference to get toilet tanks cleaned manually. High-income households, though well equipped with modern sanitation technology, use traditional ways of toilet cleaning by employing people from lower castes. The sweepers take contracts privately and work during their free hours, usually at night. Though people who get their tanks cleaned manually say that they pay for gloves and a nasal band/cover, in most cases, there is no separate payment for this safety equipment; it is included in the payment for cleaning the tank. Disposal of sludge is often the responsibility of the sweepers, as most households do not want to dump the sludge in their backyards. The sweepers have to take the waste away discreetly on their trolleys so as not to annoy the neighbours with the foul smell. They usually empty it into drains or water bodies, or on waste/forest land away from the city. The city residents avoid the question of legality, often remarking that they are not the only ones who are using manual labour, or say that the law is not imposed. Some even say that the scavengers are willing to do the work; that they do not view manual scavenging as degrading. The municipal officials avoid talking about it, shrugging off the question with a brief answer that it is a deal between the employers and the scavengers, and the municipality is not involved. Sweepers and manual scavengers are often treated with disdain. As one manual scavenger said, “People have an image about our caste – we are seen as dirty, alcoholic, badly behaved and wayward.” His remarks reiterate the fundamental schism between the so-called upper and lower castes: the perceived purity and impurity of body. Sanitation workers suffer policy negligence, and the nature of their occupation makes them vulnerable to risks involved in handling toxic waste manually. While it can be hoped that with an improved sanitation infrastructure there will be less physical risks to manual labour deployed in keeping the cities clean, the current policies and programmes are not adequate to eradicate manual scavenging. Though the National Urban Sanitation Policy 2008 directs cities to make city sanitation plan, most cities overlook this in their planning, let alone any systematic approach to eliminate manual scavenging. It is doubtful whether small municipalities that have a limited budget and mostly implement programmes have even the vision and resources to make strategic plans to eradicate manual scavenging. The national policies and programmes are based on assumptions that once insanitary latrines are replaced with sanitary ones, manual scavenging will stop. However, as we witnessed in Angul, the well-off sections do not hesitate to use manual scavengers to clean their toilet tanks. The caste system is thus a visible presence in the sanitation practices in a city that otherwise is a modern industrial centre. The practices that have been legally challenged have social legitimacy due to traditional caste divisions and practices. Without caste, sanitation in Angul, as in other cities in India, threatens to get paralysed. Given the caste stratification, it seems quite unlikely that the social composition of the sanitation workforce will change in near future. The challenge is to implement the legal restrictions as well as to make strategic plans to eliminate manual scavenging. While Swachh Bharat strives to make India open defecation free by 2019, it will be a fitting tribute to Mahatma Gandhi on his 150th birthday, if India can free itself from the practice of manual scavenging. Ranjita Mohanty is a research consultant with the Centre for Policy Research, New Delhi. Anju Dwivedi is a senior researcher with the Centre for Policy Research, New Delhi.